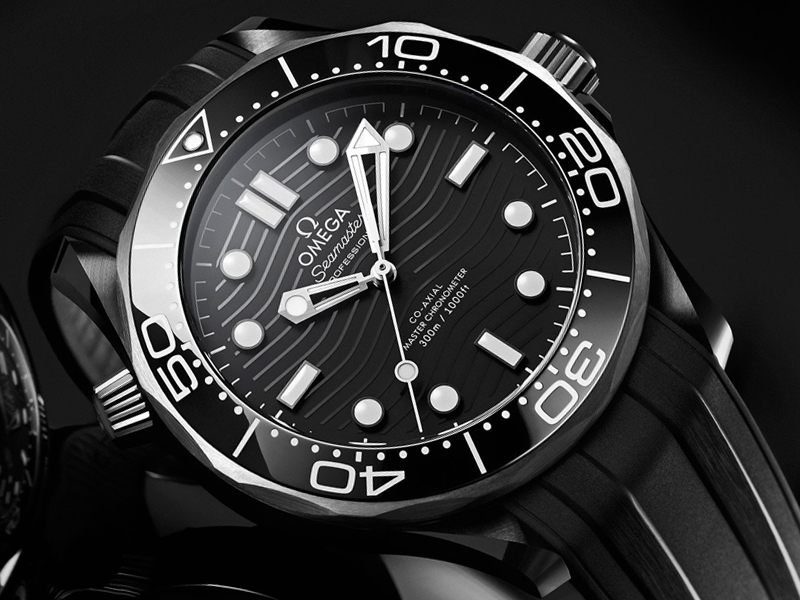 It was just last year that Omega revamped one of its most prestigious models by updating the “Seamaster Diver 300M” collection with various new options. Now in 2019 they extended it a bit further by combining ceramic and titanium in this new stealth-like edition, set to enter the market in around spring. 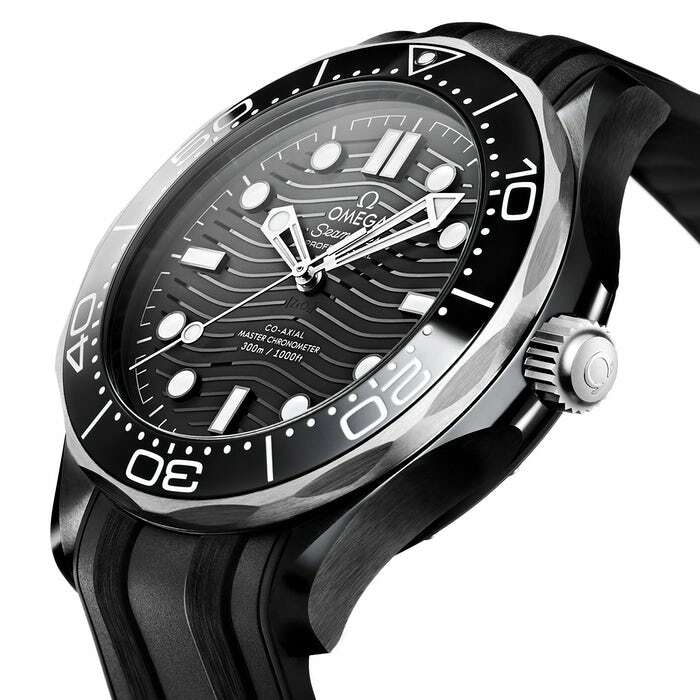 The 43.5mm case is made of black ceramic with a transparent sapphire crystal exhibition case back, which allows to view the inner workings of the mechanical movement. 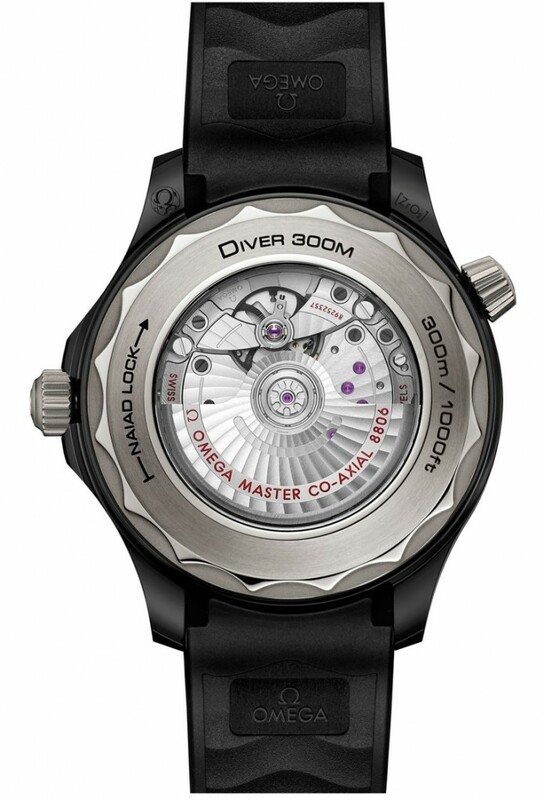 The screw-on portion of the case back is made out of grade-5 titanium with the patented OMEGA “NAIAD LOCK” lock, which ensures all the technical information and other engraving always synch into the exact place. 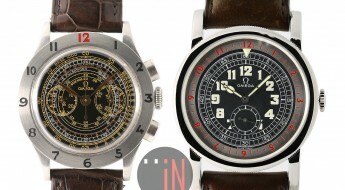 Time is exhibited on a black ceramic dial with white round dotted hour index markers, single rectangle markers for the 3, 6 and 9 o’clock positions and a double rectangle marker for the 12 o’clock spot. Alongside the inner flange of the dial are portions of white printed railroad-type minute index markers, divided by single markers for every 5-minute increment. 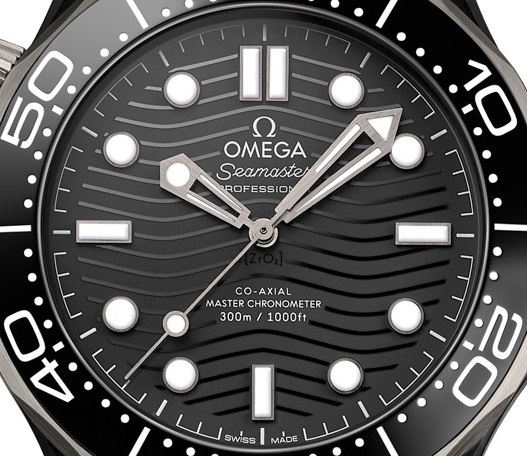 In the background the black dial is characterized by a white-toned positive relief wave pattern, which runs through all of its surface. The tips of the hollowed out central hands and all the hour index markers have been given a luminescent filling, for an enhanced legibility. 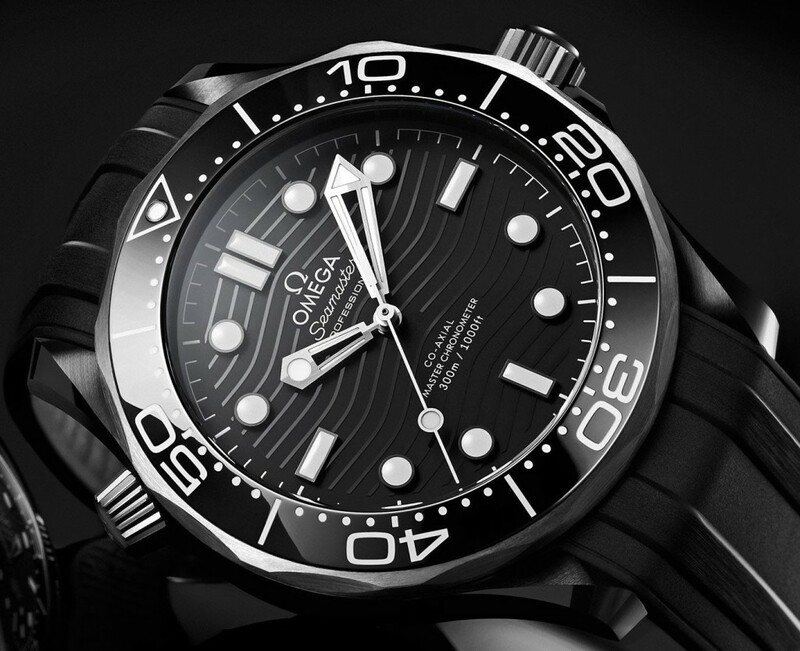 This “Omega Seamaster Diver 300M Black Ceramic and Titanium” (Ref#: 210.92.44.20.01.001) is powered by a self-winding in-house mechanical movement, caliber 8806 with 35 jewels and 25,200 vph. 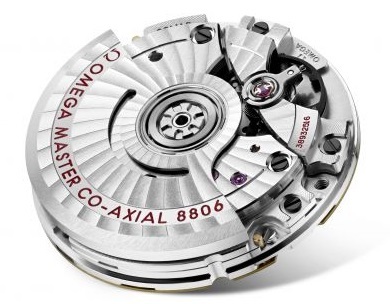 It is a METAS Master Chronometer certified movement. 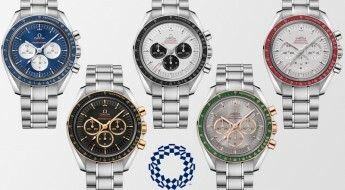 Power reserve on this timepiece can last up to 55 hours, when fully wound. 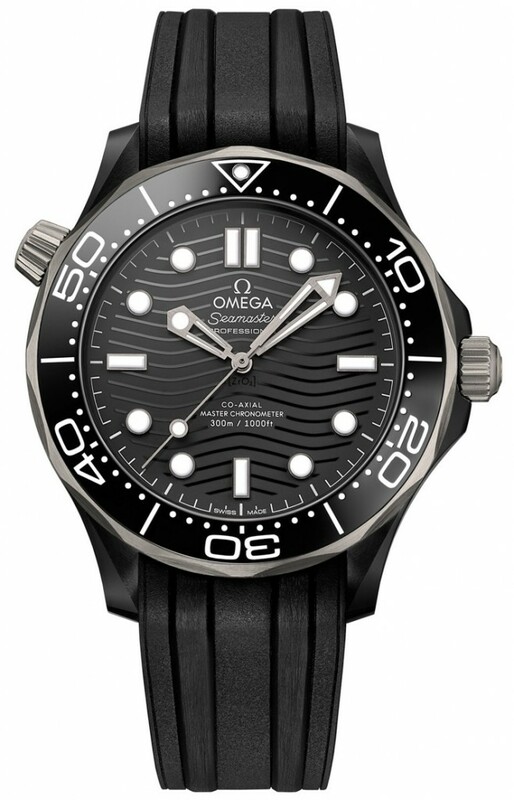 Mounted to the watch is an Omega black rubber strap with a molded patters, while secured to the wrist by a titanium buckle. 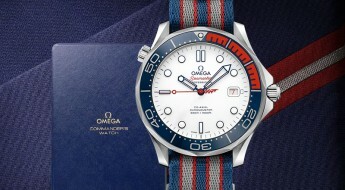 This watch will become available during the spring of 2019, for more up to date information visit the official Omega website here.